An efficient EPoS (Electronic Point of Sale) system is a critical part of any restaurant's smooth operation. From the small high street restaurant to multi-table major outlets, a modern EPoS system should be at the very heart of day-to-day operations. For a formally seated restaurant, an EPoS system that incorporates a table planner is a real boon – this allows you to manage all your bookings, days and weeks in advance. Such a powerful system helps manage capacity and staff resources well ahead of the event and just as importantly, to identify future low spots where promotional activity might boost income. Table planning systems can also request and manage deposits, generate confirmation letters or emails and if need be, facilitate pre-ordering from an advance menu – ideal for all those Christmas parties. On the day, such a system can suggest the most appropriate table layout, highlight guests due to arrive and alert for no-shows. A good table planner will also offer the facility to register your guests immediately on arrival and then manage that waiting list and evenly allocate guests and tables to available waiting staff. Once service is underway, the integrated table planner allows each waiter or waitress to make simple updates to the status of their allocated tables. This constant flow of information gives front of house an overall view of the entire restaurant's operation minute to minute and as service progresses. Such a system monitors waiting staff performance, even raising alerts for tables where matters may not be proceeding as they should do. They allow you to in effect, preset your desired level of service and then actively monitor and manage your service to achieve that preset. Some systems offer an order "hold and fire" option, which allows waiting staff to control the progress of service at individual tables. EPoS based table planning software can usually be programmed to give an easy to understand graphical representation of any restaurant. It can also help to standardize service intervals between courses and predict when any particular table is likely to be vacated. All of this powerful technology will help your service run smoothly and without unwelcome surprises – which both your guests and staff will thank you for. Maximizing efficiency of service also enables tables to be turned more rapidly, the most obvious way to increase income in any busy restaurant. An important consideration when choosing an EPoS system for a busy restaurant is ease of use. It is a sad fact that staff turnover is high in many food outlets, so you do need to choose an EPoS system that requires the minimum of staff training - letting new recruits hit the ground running. Easy to use features include touch screen tills and hand-held wireless order pad devices. Whilst traditional ordering by paper pad and pen may seem sufficient right now, employing handheld wireless ordering devices offers many additional benefits. 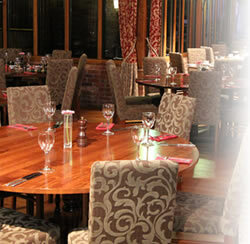 Orders are delivered instantly from the table to the kitchen and to the EPoS system for updating of the bill. Not only is this a time saving feature, it means your waiting staff maintain greater floor presence. Tables are turned faster and less staff can be required to cover the same number of tables. Lost orders become a thing of the past and mistakes due to illegible writing are eliminated entirely. Because all items sold are instantly registered to the EPoS table bill at the time of sale, there is no longer a chance of items being omitted from the final bill. As the full menu details are available on each remote device, waiting staff will demonstrate greater product knowledge when taking orders. Variations in the menu as items run out are also notified to waiting staff immediately. The system can even be pre-programmed with specific prompts to aid correct order taking and to encourage up-selling. For buffet systems, the wireless pad can even be used to send details of which dishes need topping up and for other general messages to the kitchen, bar or front of house. Many wireless pads also permit processing of card payments at the table side, giving a faster and more secure service to your guests. Some even double up as stock taking devices and include bar code readers to help with counting or identifying stock. For multiple restaurant chains, small or large, a system offering centralized menu management will aid greatly in controlling costs, quality and ensuring consistency across all outlets. At the back end of the EPoS system is the kitchen display and/or order printer. For display based systems, a simple keypad allows order details to be scrolled and completed orders to be "bumped off". Of course, a kitchen is a hot, damp and therefore hostile environment for any electronic equipment, so do ensure the equipment you select (and any consumable items it uses) are really up to the job - long term. For example, dot matrix printers with ink ribbons are far more practical in a kitchen environment, as thermal paper tends to disintegrate when wet and ink jet print will simply run and become completely illegible. As customers increasingly look to save precious money, the ability to print not only ordinary bills, but "split" and "going Dutch" bills is a good feature to look for. Check how any new system handles gratuities as well, especially those added to card payments. Any new EPoS system should integrate directly with, or include its own card payment facilities internally. Not only does this eliminate separate credit card receipts and the necessary extra printer, it removes an entirely separate card payment process. This both saves time and prevents the danger mis-keyed amounts – be they accidental or malicious. Integration also means no tiresome need for constant reconciliation between EPoS and EFT systems and the bank statement. Finally, also check that your card payment devices can be operated in "Sale Only" mode, requiring supervisor intervention if a card refund is called for. An upcoming technology to watch for is the "contactless card" - allowing smaller purchases of less than £15 to be paid for without Chip and Pin or Card Swipe. The customer literally just touches their card and the payment is taken by wireless. One in seven credit and debit cards in the UK will be enabled with this technology by next year, so it is important that your EPoS system is "contactless capable". Do watch for EPoS systems that integrate with the online systems of large UK suppliers, such as Booker. These are tremendous for simplifying ordering and eliminating mistakes. Of course, do use your EPoS system to generate stock orders in the first place. This allows you to check incoming deliveries against the original order, thereby identifying wrong or short deliveries and updating your stock levels as part of the goods inwards process. Short deliveries are unfortunately not at all uncommon, either through mistake or pilfering - and such needless losses come straight from your bottom line! Why not get in touch to discuss your restaurant's requirements?